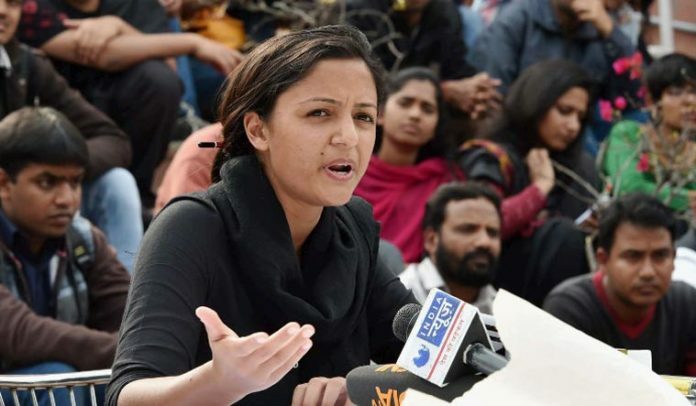 New Delhi: Jawaharlal Nehru University students leader Shehla Rashid Shora is all set to join the political party being launched by Shah Faesel, a former IAS topper from Jammu and Kashmir. Reliable sources saix that Shehla, who hails from Srinagar, has decided to join Faesal’s party after serious negotiations. According to sources, the new party will be launched during a function at Srinagar’s Indoor Stadium on Sunday. Faesal and Shehla were first expected to join the National Conference (NC), but sensing discontent among his supporters over the move, Faesal later decided to float his own party. He, however, delayed the launch even as his move for crowd funding for the party received a good response from his supporters. Sources said Shehla will be given an important position in J&K People’s Movement and will be involved in key decision making. She has been tasked with mobilising support for the party among the youth in Kashmir, especially Srinagar. Shehla would be the front runner candidate from J&K Peoples Movement for Lok Sabha and assembly polls, said sources. The 31- year-old is a former vice-president of the JNU Student Union. At present, she is pursuing a Ph.D in Technology and Citizen-State Relations at the premier institute. She came into limelight after JNU students Kanhaiya Kumar, Umar Khalid and Anirban Bhattacharya were arrested in February 2016 for protesting against the execution of Parliament attack convict Afzal Guru. The three were accused of shouting “anti-national” slogans on the campus. Shehla led the students agitation demanding the release of the students. She has been a bitter critic of the Bharatiya Janata Party government at the Centre and its policies towards minorities and Kashmir. She has also been vocal on social media about various issues, especially the human rights situation in Jammu and Kashmir. Previous articleGovt gives additional charge to Yasmeen Khan, shall look after work CEO WMDA. Next articleIndia awards 200 Golden Jubilee Scholarships to Nepali students.